A full set of ping-pong sized bingo balls of various designs. Set of ping pong sized bingo balls that have the number printed on each side. Set of ping pong sized bingo balls that have the number printed on each ball 12 times. Set of ping pong sized bingo balls that are colored on one side and white on the other. The number is printed on the white side. Made in China. Set of ping pong sized bingo balls that are printed double sided for ease of reading. The balls are numbered B1-O75. 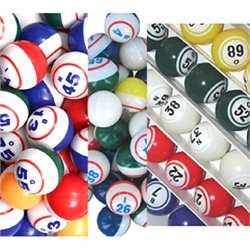 Each letter of Bingo has its own color and each ball is clearly labeled six times for ease of use. These are ping pong sized bingo balls.